Had a semi productive day yesterday and today. Had a good meeting with client and stayed until 4 in the office with so much work done. It was pouring when I left work, then stopped and poured again. Stopped by at Wal-Mart after picked my husband up. I went in to get stuffs for my cake order. By the time I was done shopping, it was madness. Soaked wet to get into the car. Umbrella did not even work its purpose. 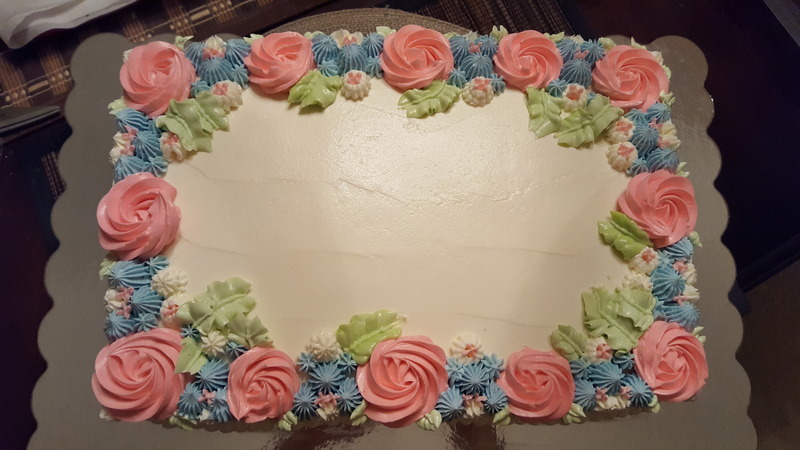 Stayed up until 2 am working on the cake. It was a last minute order. I saw a post on next door app. Someone looking for a cake decorator. So I offered to help as they have not find anyone to do it for them after couple days they posted. Just basic cake with a mix of 3 different flavors, chocolate, strawberry and vanilla. 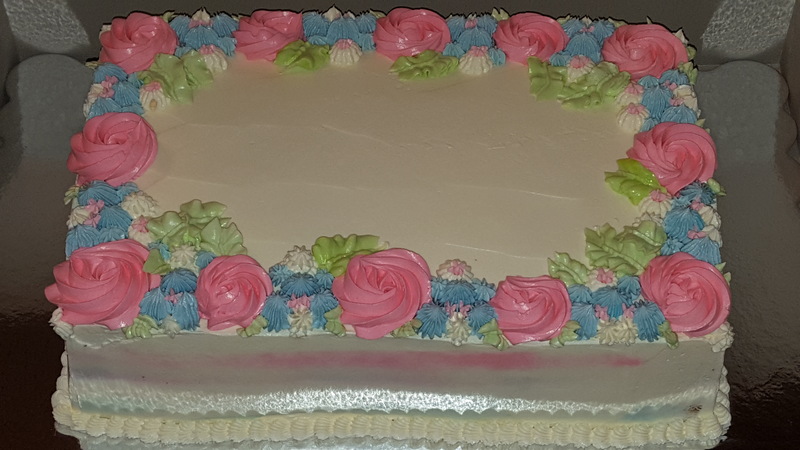 With buttercream and water color effect in the 2 colors theme on the sides and flower decoration in blue and pink. So here it is. Delivered the cake today. Hope they like it. Dinner time just creeping on me. I was watching tv and saw the time it was 6:24. Oh boy..what’s for dinner? 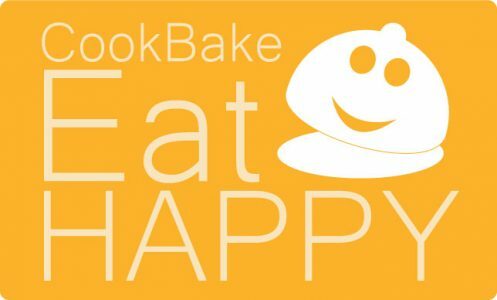 I hate to suggest take out since we did yesterday. I know I have ground beef in the fridge, so I thought, meatloaf. I have potatoes and carrots. No greens though. Mix my meatloaf in kitchen aid. All mix well in the kitchen aid with paddle attachment. Shape them into the loaf and spread sauce on top. Well, that was the plan, until I could not find my aluminum foil loaf pan nor the aluminum foil. Hummm what to do? I have parchment, so I thought … roll them into log. I divided the mixture into 4 and rolled on the parchment and twist the end. Stacked them on the rack in Instant Pot and add 2 cups water under the rack. Closed the lid and vent and press 25 minutes. Well since I can’t put the sauce on top of the meatloaf..errr..meatroll, I decided to make the sauce and drizzle on top the rolls after it’s done cooking. Sauce is a mixture of 1/4 cup ketchup, 1/2 cup worchesthire sauce and 3 tablespoons brown sugar. Heat up 1/2 stick of butter and sauteed 1/4 medium onion finely chopped until translucent, then add in the sauce mixture. Cook until bubbly. Turn heat off and set aside. By now the meatroll is almost done. Time for the potatoes and carrots. Peeled the potatoes and carrots, washed and arrange them in the pot. Add water just enough to cover the potatoes half way. I did both whole, not cutting them up. Thought I’d just cut them up when they are done. Closed the lid and vent. Manual 3 minutes. Just to cook the c carrots first. When it beeped, release pressure, take carrots out and closed the lid again and run manual 5 minutes to continue cooking the potatoes. They were done at the same time. Took the meatroll out, unwrapped and sliced. Arrange on the plate with the carrots and potatoes. 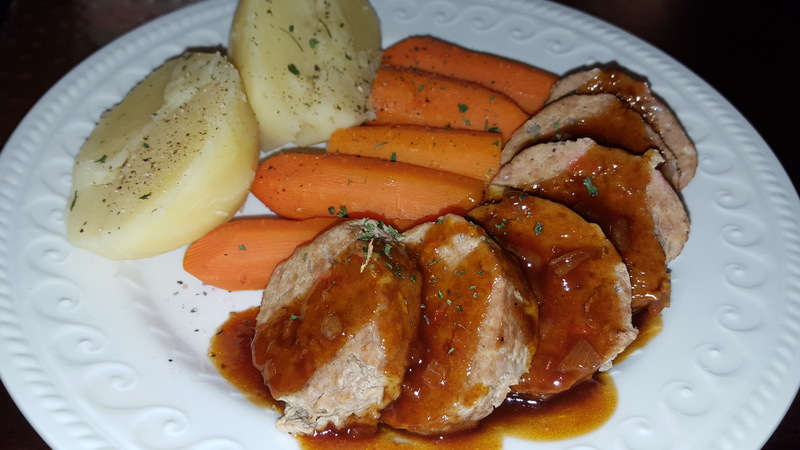 Drizzle the sauce over meatroll, add salt and pepper on the veggies. I did it on purpose not adding any seasoning for the potatoes and carrots so that I can share some with Max the puppy. It was so filling and good. My boys both had clean plates, I mean cleaned. Meatloaf is one of our comfort food. And meatroll too hahaha. Definitely a keeper.